A race that confirmed to Gavin that he made the right decision to breed a family around LINCOIN was from Greytown 504km. It was pigeon weather with a headwind all the way where the best pigeons race in front. Gavin got three birds on the drop and all three were from his LINCOIN line. First over the clock was BORDER 15/83838 (daughter LINCOIN), then GPU 13/18533 (sister LINCOIN) and then BORDER 15/71925 (grandson LINCOIN). Speed 1201mpm. Result should have been 1,2,3 Combine and 1,2,3 Union, but Gavin realized a few minutes later that 83838 was never clocked. He caught her and clocked her three minutes after she should have been clocked – still good enough for 1,2 and 8 Union. Another special result was that of LINCOIN’S son BORDER 15/71937. He was crowned 1st ace bird at the 2016 DIAZ ONE LOFT RACE. 71925 has turned out to be a very good breeder. He is the father of BORDER 17/3230 (1st prize winner), 3231 (1st prize winner) and 3273 (2nd prize winner). 3231 won a very difficult EC & BHU Combine race from Touwsriver with a winning speed of 1050mpm. Distance 735km. 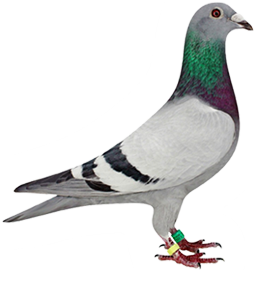 In the BHU only 3 birds made it home on the day and 2 were Gavin’s – 3231 (granddaughter LINCOIN) and 3220 (daughter LINCOIN’S sister 18533).